Apostle Philip Sithole of Divine Word Ministries in Hammanskraal is making the headlines after he reportedly commanded his church member to touch live wires and also got another drunk through anointed water. In the video released by The Daily Sun, Apostle Philip Sithole first announced that he would command people to touch live wires and they will not get electrocuted. 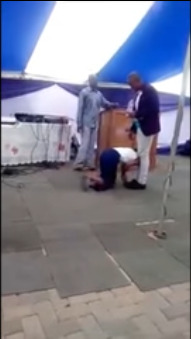 He then invited a lady out to the podium and ordered her to touch live wires, before asking a man to drink from an anointed water, who instantly got drunk and lost his balance.